We all have digital tools we use to help streamline productivity in our personal and professional lives. I decided to document mine here with the idea that you might find value in using them as well. This is not a comprehensive or static list. I will update it as I remember or enact a new process. If there’s a tool I am missing or one you think is better than the one I am using, please let me know in the comments at the bottom of the page. Akismet – I use this plugin to control spam. Not much makes it through this filter. All-in-One SEO – This easy-to-use plug-in allows me to automatically optimize this blog for search engines. It’s almost always on the lists I see of “must have” blog plug-ins. Author Bio Widget – See that little Prof KRG bio on the right side of this page? It was created with this plug-in. BlueHost – I use BlueHost to host this blog and the student site I oversee at work. I love BlueHost. I’ve deleted this site more than once while attempting to alter the code. I used their online support system and they had the blog relaunched within minutes. Broken Link Checker – This plug-in automatically checks my blog for broken links and notifies me in the dashboard if any are found. Comment Redirect – This plug-in allows me to redirect first-time commenters to a special page that introduces them to this blog and my social media accounts. It essentially allows me to welcome new readers to the site. Contact Form – This plug-in gives readers a method of contacting me via an official form from this site. Genesis – I switched my blog a couple of years ago to the Genesis Framework, developed by StudioPress.The child themes provide the shell of a theme that I can easily alter as I teach myself enough about coding to be dangerous. I actually bought myself the developer package as a birthday present. It was a wonderful investment. I also use a variety of plug-ins within the framework, including Genesis Custom Backgrounds, Genesis Featured Images, Genesis Layout Extras, and Genesis Post Teasers. Google Analytics – I use this free tool to track the metrics of this site. It’s easy to set up and fun to see who is reading and what they’re viewing. Google XML – I won’t get into the nitty gritty details of how this plug-in works because I probably don’t understand them. But I know that it makes this site more readily indexed for search engines, which I figure is a good thing. Instagram Feed – This plug-in allows me to display my Instagram feed as a sidebar widget, automatically updating my blog when I post a new photo on Instagram. LinkWithin – This plug-in shows related stories under each post, suggesting other reading within this site. It allows me to continue exposing readers and keeping them engaged with archive content. Livefyre – I love this comment platform that allows realtime updates, social network comment integration, friend tagging on Facebook and Twitter, and comment moderation. I wrote this post to help my students understand how to use Livefyre to comment on this blog. Post2PDF Converter – One of the key functions of this blog is to provide supplemental information for media students and professors. Therefore, it was important for myself and others to be able to use the site in the classroom. This plug-in allows readers to turn any page on this blog into a handy dandy handout. I use these handouts in classes and for training the student media staff I advise. Sometimes a tangible handout is just better than sending a link. PostRank – This plug-in allows me to see which content on this site is getting the most views and share that information with readers. Quotes Collection – This is my favorite new plug-in. Writers love good quotes. I’ve always been drawn to meaningful, thoughtful and fun quotes from others. This allows me to easily share quotes that resonate with me on this site. It also automatically rotates through the quotes, so I don’t have to worry about remembering to change them. Scribe – I use this premium plug-in to optimize my WordPress posts. It analyses each post, then assigns it a percentage grade. I just started using the system, but it’s a bit expensive for a site that isn’t a revenue source. I’m still testing to see if I’ll continue using it. Shareaholic – This plug-in places social media sharing buttons at the bottom of your posts. I love the way it looks. Social Circles – This StudioPress plug-in creates circular social media icons for the header or sidebar of your website. I added the plug-in in March 2013 when I redesigned this site. I love the alternative to having regular social media logo buttons. Social Metrics – This plug-in creates a dashboard inside your WordPress site, allowing you to compare how well your posts perform on social media. This can help you better understand what content is most sharable and desired by your audience. Theme Test Drive – Here’s my confession: I love to change my blog’s theme. I limit how often I change it to once every couple of years, but I like to keep it updated. Using this plug-in that allows you to “test drive” a theme on your blog while visitors see the default theme is a must. Otherwise, you’re up all night trying to make your blog presentable just to realize that you hate the newly-installed theme. Trust me. I have some negative experience with this. Do not redesign your blog without this plug-in. W3 Total Cache – This caching plug-in will increase the loading time of your blog up to 10 times. This is super important because you don’t want long load times on your site causing people to get frustrated and leave. Widget Entries – This plug-in allows you to add text to your site anywhere you can place a widget. I’ve used it in the sidebar and in footers previously. It’s a nice option to have when you want to add a message for your readers. WordPress – A self-hosted WordPress site is the only way to go if you’re serious about blogging. Just do it! WordPress Editorial Calendar – I work on my blog whenever I have little bits of time. That means I often forget which posts I finished and when I planned to run them. This editorial calendar plug-in helps me organize and schedule posts. WordPress Importer – I moved my blog from a WordPress.com site to a self-hosted WordPress site a few year ago. This plug-in made that process simple. I highly recommend it. WP Google Fonts – If you think I’m nerdy about words, you should see me swoon about typography. Google Fonts allows me to take free open-source web fonts and add them to the site. The plug-in just establishes a menu that loads straight into your CSS. It’s really simple and fun to use. iTunes – Of course I use iTunes. Doesn’t everyone? Spotify – listen to music from your iTunes library or from that of your Facebook friends. I use this at home and in the office. Of course, you also can share what you’re listening with friends on your Facebook news feed. Don’t you just know that everyone loves knowing what I’m listening to at any given time? Keynote – This presentation software ruined me to PowerPoint. Keynote is one of my favorite things about Mac. It’s easy to use and creates much more visually appealing slides. It’s also easier to add video and music than in PowerPoint. The only thing I have to remember is that not everyone runs Keynote. This means I usually need to take my own laptop for presentations and remember to convert or PDF presentations that I want to share with others. SlideShare – This site is another easy way to share presentations with others, including making them available to the general public. You also can use SlideShare to generate code to embed a presentation into your website. Visible tweets: This is a fun way to start presentations, but be sure you know what types of tweets might show up. You don’t want to start your presentation embarrassed. 2Do – You may have noticed by now that the visual appeal is just as important to me as usability when it comes to my tools. Although others swear by to do list apps like OmiFocus, I can’t ignore the boring design. That’s why I love this app. Not only does it provide a GTD-based productivity system, it also is attractively designed. If you don’t want to pay $30 for the Desktop version, you can sync it through Toodledo and access it anywhere. Chrome – This is my browser of choice. I find that it is faster than Safari or Firefox and the available extensions make it more productive. Did I mention that it’s well designed and you can change the look from time-to-time? Doodle – I manage a staff of about 10 student media editors and up to 30 student staffers. This can make it difficult to schedule meetings. While I can’t accommodate everyone, Doodle allows me to suggest times to the group and have them select the ones that work for them. It’s a great tool for getting the most people possible to any event. DropBox – I use this application to sync files between the multiple computers I use at home and at the office. That way, I never have to worry about whether I have a document I need. Evernote – I use Evernote to archive items I want to be able to search and access later. For example, I have outlines of all of my dissertation materials and the digital document saved in Evernote. I also collect articles for classes and blog post ideas on Evernote. Gmail – I used to have three email accounts. That didn’t work well. I always forgot to check one of them. So, I decided to combine them all into one gmail address under my name. If I had this to do again, I would use an Apple email, but that wasn’t a viable choice at the time. iCal – I sync my life through the iCals on the various computers on which I work and on my phone. It’s my favorite calendar app. I especially love the color coding and simple design. Keeper – How many zillion times do we have to change our passwords? And it seems like each change requires another number or special character. It’s impossible for me to remember all of the passwords I need between school and personal life, so I keep them all with the Keeper app. It’s simple to use and means I always have my passwords with me on my phone. List Ease – If you know me well, you know that I hate grocery shopping. Part of the reason is that I make menus, then a grocery list and still seem to always make it home without something we need. Honestly, it sometimes seems like I could spend my life running errands. This app helps me organize my grocery list by giving me a place to document any purchases that need to be made. That way, when I stop at CVS to pick up a prescription, I can open the app and see that we also need vitamins and tissues while I’m there. Sign Up Genius – I use Sign Up Genius to help schedule meetings with the student media staff I advise. I just enter the times I’m available for meetings and the staffers can go in and sign up for times that work best for them. The site then sends me emails to let me know who signed up when. It’s a great tool for semester evaluations, advising appointments, etc. Streaks – I’m a pretty competitive person, and I love to challenge myself. This app allows me to keep track of how many consecutive days I perform an activity, attempting not to break my streak. I use it to mark the days I go to the gym. It’s great to see all of those red Xs on the calendar at the end of the month! Amazon Wishlist – I have almost 1,000 items on my Amazon Wishlist—and they’re all books. The Wishlist extension in my Chrome browser allows me to mark books I want to purchase each time I read a review or look up a text. This means I always know what I want to read and how much it will cost. Oh, and it makes it really easy to spend those Amazon gift cards my Mom buys me for my birthday. AP Mobile – I consider the AP the source for breaking news. They have a great mobile app and deliver accurate and fast alerts. With this on my phone, I always feel informed. Audible – I live in the sticks, so I spend a lot of time commuting to-and-from the office. I listen to audiobooks during my commute. I also listen to them while I’m at the gym and sometimes when I’m in the shower. The Audible app on my phone means I always have a book to plug and play. CNN – Another traditional news source with an excellent app. I also enjoy CNN breaking news alerts on my phone because they keep me updated on what’s happening in the world. Buffer – I tweet a lot. Buffer allows me to spread out tweets and Facebook updates for items I want to share, scheduling them so as not to overload my followers with my content. Facebook – I have a personal Facebook account for family and friends and a page for this blog. Google+ – I’m still exploring the full benefit of Google+. It hasn’t really caught on for me, but it does have a visual appeal that some of the other social mediums are missing. You can find me here. HootSuite – I use HootSuite to schedule specific times for Twitter and Facebook updates. LinkedIn – I don’t use LinkedIn as much or as well as I should. I keep saying I’ll redo my profile, but… It is important to have a presence on the site. Pinterest – I love Pinterest just as much as the next person, but I don’t use it for professional purposes. The main things you’ll find on my Pinterest board are quotes, recipes, exercises, and clothes. Triberr – Don’t even get me started on how much I love Triberr. The platform allows me to import my posts automatically to groups of people who I know are interested in sharing the content I create here. It also allows me to be part of virtual communities that allow one-stop to read and share amazing content from all of my favorite bloggers. It’s a dream! Twbirthday – a fun method of tracking when you started tweeting and who you followed first. Twiangulate – allows you to know who your most influential Twitter followers are. Use this to guide your content and sharing. Twitter – I love plain ‘ol Twitter. It works as well as just about any other option for viewing your Twitter stream and interacting with those there. The exception is TweetDeck, but I hate to even mention that platform since it’s going away. I guess you could enjoy it for now. AP Stylebook – I bought the AP Stylebook app for the first time this semester. It’s nice to always have a Stylebook on hand, but I still prefer the paper copy. One great thing about the app is that it’s searchable. Day One – I’ve never been big on journaling because I don’t like writing things down that I wouldn’t want the world to read. But, after repeatedly reading about the positive effects of journaling, I decided to try this app. It allows you to store thoughts, memories and mementos is a password-protected online journal. I’m still not sold on the whole journaling thing, but the app is nice. Dictionary – I like this free dictionary.com app. My kids also use it. However, once again, I prefer to just use the pocket dictionary that I keep on my desk. 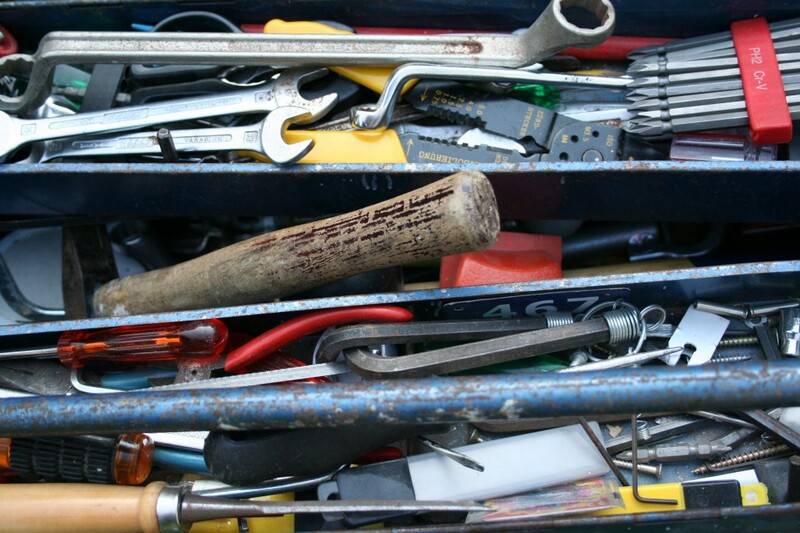 profkrg I approve of the apps and programs in your toolbox. jimmypyles well, thank you, sir. That’s high praise. I still have reading apps to add, but it’s pretty complete. profkrg Great! And I love the new website! EGib Thank you! It was an accidental Spring Break project. I just got started and couldn’t stop! WOW! Great list. I have Genesis also but use the Expose Child Theme. Do you think those other Genesis plug ins you mentioned would benefit with my theme? Now I have to go over each one of your suggestions. It’s going to be a long day. audaciouslady I’m glad you find it helpful. Yes, it’s quite possible that these other plug-ins for Genesis would help your site. Take a look at them and see what you think. I really love the platform, don’t you? What a fantastic list! Thanks so much for sharing it! Marian Dougan I’m glad you find it helpful, Marian. Hey there. Are you still using these same tools? One of them, PostRank is in Chinese. Thank you for directing me to this article. audaciouslady Yes, I still use them. That may not be the correct link. I would just search via your plug-ins tab in WP.